Superior during their migration west to seek wild rice or “food that grows on the water” to fulfill a tribal/spiritual quest. 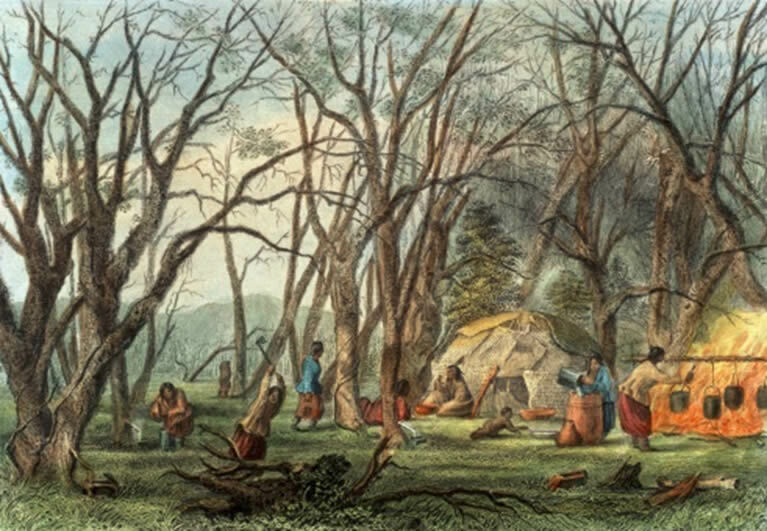 After constructing a large tribal community at LaPointe the Ojibwa participated as envoys for the French in running exchanges during the Fur Trade. Ultimately, the Ojibwa fought rival Indian groups and gained control of much of the interior lands surrounding Lake Superior. By mid-1700’s the Ojibwa had gained control of Manitowish Water area which was surrounded by 3 different Ojibwa bands located in Lac Du Flambeau, Trout Lake and Turtle Lake (Mercer). The area of Manitowish Waters was affiliated most closely with Lac Du Flambeau and had numerous Ojibwa camps and villages along the shores of the lakes. Besides trapping hunting and fishing, the Ojibwa on the Manitowish Chain gathered wild rice, maple sugar, berries, nuts, and plants for medicinal purposes. All of these actives were embedded into Ojibwa culture and tied closely to the different seasons. Starting in the 1820’s the Ojibwa entered into numerous treaties with the U.S. Government and slowly ceded their land to the government. Even though, the Ojibwa were to retreat to the Lac Du Flambeau Indian Reservation that continues to share a border with Manitowish Waters, a strong Ojibwa presence remained due to historic ties. Both permanent and seasonal Ojibwa enclaves continued into the 20th century on Manitowish, Clear, Rest and Big Lakes. By 1736 the Ojibwa/Dakota (Sioux) alliance was broken and intertribal warfare resulted, each tribe attempting to secure the resources of the interior region (Manitowish Waters) and lake shore of Lake Superior. (4) This marked the beginning of over one hundred years of battle between the Ojibwa and Dakota Indians. European technologies and geographic knowledge the Ojibwa had gained from the fur trade allowed them to take large sections of territory from the Dakota and Fox Indian Nations. The resources fought over were wild rice, maple sugar, gardens, game, and fish which were acquired following seasonal economic activities that would ultimately be expanded one-hundred miles south of Manitowish Waters. Ojibwa broke into related family groups to better use resources. These smaller bands chose areas which could be defended from rival Indians and economically support the Ojibwa band population. Indian Sugar Camp, by Seth Eastman, U.S. Army, 1850’s. The area where the Ojibwa wanted to establish winter camps was the game-rich area in the lower Chippewa River valley known as the “tension zone”. (7) The tension zone received its name from modern academics, due to the numerous Indian tribes that fought for control of this important resource area. The Ojibwa could not settle the interior region until the rival Indian tribes of the Fox and Dakota had been removed. 1783, probably completed the Ojibwa occupation of the Lac Du Flambeau area and Manitowish Waters when the Fox were forced out of the Wisconsin River basin. (8) The Ojibwa of the Lac Du Flambeau area no longer had to fight a two-front war against the Fox and the Dakota. All the Ojibwa’s military energies could now be unified and concentrated in the tension zone of the Chippewa River valley. The Lac Du Flambeau area and Manitowish Waters began to stabilize relative to external threats. The Dakotas did attack all portions of the interior region, including the Flambeau area, but the majority of Dakota- Ojibwa battles occurred in the Chippewa River basin and to the west. During this period, the Ojibwa bands of the Lac Du Flambeau area established their six traditional villages of Lac Du Flambeau, Turtle Portage, Trout Lake, Lac Vieux Desert, Pelican Lake, and the Wisconsin River. Manitowish Waters was most associated with the Lac Du Flambeau band. In 1763, after the Treaty of Paris the French government lost control of the Great Lakes fur trade, and, in 1783, the Scots established the North West Company. Traders set up winter posts in Lac Du Flambeau by 1790- 1791. (9) By the winter of 1790-1791, Lac Du Flambeau clearly had a well-established fur trade post and enjoyed the support of the surrounding Ojibwa bands. With the economic support of the fur trade, some Ojibwa Indians likely became permanent residents of the Lac Du Flambeau area and Manitowish Waters to hunt and trap for the traders. Fur traders would travel to distant Ojibwa camps to trade for furs and storable food. Using alcohol and trade goods fur traders bartered for storable food like wild rice and potatoes that could force the area Ojibwa to resist traveling to the lower Chippewa River, winter in Manitowish Waters to hunt and trap. The United States would forever change the relationship between the Ojibwa and Europeans-Americans. The Ojibwa suffered the same fate as other Indian tribes dealing with the United States. Scientific expeditions entered the Ojibwas’ territory and assessed the value of extractable natural resources. After the resources of copper, iron, timber, farm land, and hydropower had been identified, the American government and military took steps to claim much of these resources from the Ojibwa. Until the European fur market crashed in the 1840’s the fur trade remained strong. In 1842, the American Fur Company failed and the Ojibwa had to modify their economic cycle. (12) The important events which dominated the Lac Du Flambeau area bands of the Ojibwa were the treaties between the United States of America and the Ojibwa. The Ojibwa were signing over land and natural resources to the federal government of the United States in return for annuities, services, and legal privileges. The Ojibwa bands of the Lac Du Flambeau area and Manitowish Waters maintained their economic cycle and migrations into the 1870-80’s before treaty enforcement, encroaching white settlers, lumbermen, railroads, and miners controlled or destroyed much of the economic resources which supported this nomadic cycle. The treaty which first influenced the Ojibwa was the Treaty of 1825 at Prairie Du Chien. This treaty divided eleven different Indian tribes into specific territories allegedly for the purpose of promoting peace among rival Indian nations. A more likely reason for this documented division of territory was to aid the United States in claiming Indian territories as federal property. The treaties which had the greatest impact on the Ojibwa of the Lac Du Flambeau District were those of: 1837, 1842, 1847, and 1854. The 1837 and 1842 treaties both dealt with land cessions from the Ojibwa to the United States. Each of these treaties gave valuable Ojibwa resources to the United States: “Through the 1837 treaty, the government gained access to rich pine lands and because of this it was referred to as the ‘Lumberman’s Treaty.’ The 1842 treaty was referred to as the ‘Miners Treaty,’ since the government acquired rich mineral districts.”(13) The 1847 treaty clarified the services and annuities due to the Ojibwa and once again attempted to bring peace between the Dakota and Ojibwa Indian Nations. The Ojibwa of Lake Superior, including the Lac Du Flambeau area, were put on reservations in their final land cession to the United States in the 1854 treaty. Though the Ojibwa continued to visit their traditional camps or villages on Fox Island, Big Lake and Manitowish Lake until the 1870’s. Economically, the Ojibwa were being restricted in their use of traditional natural resources. To supplement these resource losses, the United States Government guaranteed the Ojibwa annuities, services, and special privileges. Annuities were distributed to the Lac Du Flambeau District bands of the Ojibwa in the early fall at La Pointe. Annuities were trade goods, weapons, food, and other items which supplemented the Ojibwa’s economy. Government annuities would have been helpful if the United States Government and its agents would have demonstrated any degree of realism in the choice, distribution, and administration of annuities. The first problem arose about the time of annuity distribution. The early fall was the important ricing and hunting season which generated food for the difficult winter. (14) Under the annuity system, the vital resources of the annuities now competed with the traditional resources of hunting and ricing. Annuity goods shared by the government were often useless (saddles for horses they did not have) or defective goods that sometimes injured recipients. Fur traders took Ojibwa annuities with the government’s blessing for debts owed from previous years (16) and highwaymen (usually miners) would rob the Ojibwa as they traveled home over the Flambeau Trail. (17) Little wonder that not all of the eligible Ojibwa showed up for their annuity payments in the following years. The United States’ Government was clearly derelict in its duties. By the 1870’s, the traditional cycle which the interior bands of the Ojibwa had followed mostly ended, or was limited to reservations. By the late 19th century, the Ojibwa of the Lac Du Flambeau District had entered into a new phase of their existence which was dictated by the demands of the United States Government. In the 1880’s many Ojibwa began to create new relationships with American lumbermen, resort owners, railroad interests and other emerging business to support their families. Manitowish Waters had two long term Ojibwa villages or camps, one on the south end of Manitowish Lake on the current property of Chippewa Retreat, and the other on Fox Island of Rest Lake. Both of these sites are private property, had Ojibwa burials, and have multiple citations supporting the continued occupation of the communities. 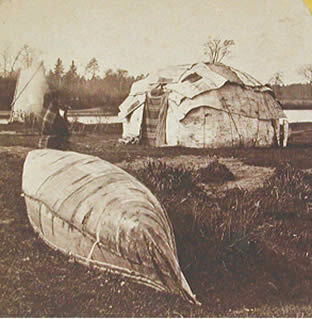 Other short term Ojibwa seasonal communities were also located on Island and Big Lakes. Manitowish Waters pioneers who married Ojibwa spouses include Peter Vance, Dan Devine, and Joe Lavigne. The Manitowish Lake Ojibwa village has been associated with the small island near the outlet of Manitowish Lake. (18) Stories of the small island’s burials and “floating rafts of flowers” have been published in early newspapers, but have not been corroborated with citations beyond numerous oral traditions. While the village site on the south end of Manitowish Lake (name sake for a major regional river system) enjoys numerous historical citations by scholars, government agents and early residents. The raised log or birch bark Ojibwa burials are gone from this site, but rare red pine trees used for pine pitch manufacture testify the site as authentic and significant. The Ojibwa camp on Fox Island was historically a peninsula of Rest Lake, surrounded by key resources to support this small community. Ojibwa burials on the western end of the site were destroyed in 1902 by dramatic increases of the water level from the Rest Lake dam. Much of the original village or camp was claimed by the rising lake levels. An 1878 Army Corps of Engineer map documents wild rice growing next to the peninsula that becomes Fox Island. A mile north of the Ojibwa camp a portage to South Turtle Lake included a secondary trail to a sugarbush that was document in the original surveys of the region in 1863. (19) The sugarbush trail that splits off to the east was clearly made to facilitate travel from Rest Lake. Nearby fishing rapids both upstream and downstream from Fox Island would allow Ojibwa to harvest fish year round using nets, spears, line, weirs or fish traps. When H. E. Fox acquired the property of Fox Island, Joe Ilg senior operating a resort west of Fox Island made an “Indian Camp” to the south of his resort. (20) In 1918, an article in Outer’s Magazine chronicled this unique arrangement, and the Ilg family had long term personal and professional relationships with area Ojibwa. (20) Serving as guides, craftsmen, lodge support, and general labor Ojibwa activities on Rest Lake continued into the 1920’s. One of the greatest Manitowish Waters historic mysteries is the location of the first documented resident of our community, chief White Thunder. Cross Lake (Rest, Stone or Spider) was the site for the Indian camp of White Thunder, as geologist A. B. Gray indicated in his 1846 journals. (21) “In the evening we entered ‘Cross’ lake from the river – so called by the Indians from its shape resembling a cross in shape-and encamped upon a point of land jutting out forming one of the arms of the cross. Upon this point are two large wigwams and several acres of ground cleared and cultivated, being the summer residence of ‘White Thunder’, a tall and athletic looking Indian. He had reached home the day before from the payment of La Point, and received us in a very friendly manner. Here he lives with his brother, in the possession of all around him, no one seeking to molest or disturb him. Unlike civilized man in this respect, the Indian fears not his neighbor; he leaves his wigwam unprotected – his canoe, his net, or trap, without a guard – conscious that no brother of the tribe will disturb his property”. Interestingly, White Thunder was an important chief of the Lac Du Flambeau band and signed the 1837 Treaty. Additionally, White Thunder and/or his brother were revered as leaders in the Medewiwin religion, as evidenced by Gray’s citation, “After a detention of a day and a half at this encampment, (our guide stopping with the other Indians to join in a “medicine dance” for the cure of a sick pappoose,) we continued the ascent of the Chippewa, and in the afternoon, at 5 o’clock, came to Trout lake…”. The Ojibwa Medewiwin religion was based on medicine and healing; and was headquartered at LaPointe. Gray also noted the day’s travel from 6-Pause portage (just south of the modern town of Manitowish) in his expedition journals. “Our course up river for about 10 to 15 miles was easterly, although the stream curved around in every direction, occasionally opening into small and picturesque lakes, surrounded by high land, with excellent pineries, and narrowing again to a width barely sufficient for passage of a canoe.” The 1840 journals of surveyor Thomas Jefferson Cram, who also traveled along this route, reinforce the description by A. B. Gray. 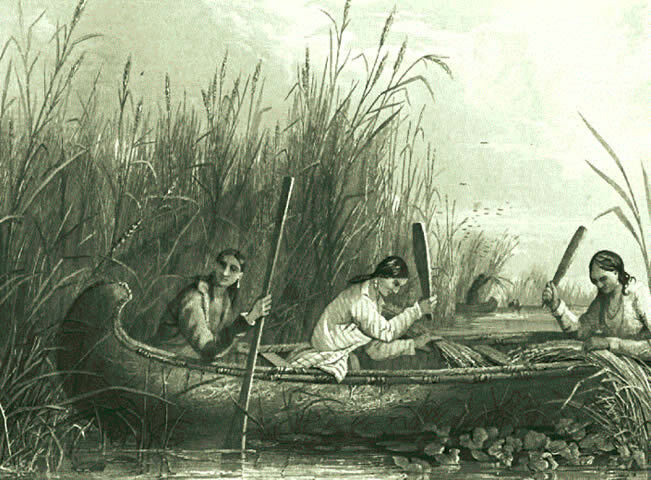 Gathering Wild Rice, by Seth Eastman, U.S. Army, 1853. An Ojibwa trail network from Lac Du Flambeau to Island Lake is clearly illustrated in the 1863 original survey maps. These trails enter the Manitowish Chain on the south side of Wild Rice Lake traveling from the north side of Ike Walton Lake. Next the trails continued from the north side of Wild Rice Lake just west of Woody’s Resort, crossed highway 51 near Townline Sports, and entered Island Lake off the steep banks of the narrow bay on the south side of Island Lake below La Fave Road. (22) The conclusion of the trail network was likely a large documented sugarbush on the north side of Island Lake. The trail network was logically for late winter early spring travel to sugarbushes using toboggans. The route of the trails, use of lakes, wetlands, and distances traveled are illogical for canoe travel. Though the route from Ike Walton Lake to Island Lake would be perfect for a frozen environment. This route would facilitate Ojibwa following traditional economic activities, returning from wintering in the lower Chippewa River basin to northern sugarbushes and summer villages. 1 Edmund Jefferson Danziger Jr., The Chippewa of Lake Superior. Vol. 148. The Civilization of the American Indians Series, (Norman: University of Oklahoma Press, 1978), p. 7. 2 Barbara Wyatt, ed., Cultural Resource Management in Wisconsin, vol. I, Manual for Historic Properties, (Madison: Historic Preservation Division of the State Historic Society of Wisconsin, 1986), p. 2-1. 3 Harold Hickerson, Ethnohistory of the Chippewa in Central Minnesota, Chippewa Indians vol. IV, Garland series, American Indian Ethnohistory, edited and compiled by Davis Agee Horr, (New York and London: Garland Publishing Inc., 1974), p. 38. 4 Hickerson, Ethnohistory, p. 40. 5 Wyatt, Cultural Resource Management in Wisconsin, p. 2- 3. 6 William W Warren, History of the Ojibway People, Intro. Roger Buffalohead, First edition 1885, (St. Paul: Minnesota Historical Society Press, 1984), p. 191. 7 Jeanne Kay, “The Land of La Baye: The Ecological Impact of the Green Bay Fur Trade, 1634-1836” (Ph.D. dissertation, University of Wisconsin, Madison, 1977), p. 19. 8 Warren, History of the Ojibway People, p. 192. 9 Interview with Ben Guthrie, Lac Du Flambeau, Wisconsin, 19 September 1986. 10 Charles E Cleland, “Economic Change Among The Lake Superior Chippewa During The Nineteenth Century”, (paper presented to the Bad River Band of the Lake Superior Tribe of Chippewa, Odana, Wisconsin, 1 June 1985), p. 40. 11 Christopher Vecesy, Traditional Ojibwa Religion and its Historical Changes, (Philadelphia: American Philosophical Society, 1983), pp. 16. 12 Interview with Ben Guthrie, Lac Du Flambeau Wisconsin, 14 November 1986. 13 2 Barbara Wyatt, ed., Cultural Resource Management in Wisconsin, vol. I, Manual for Historic Properties, (Madison: Historic Preservation Division of the State Historic Society of Wisconsin, 1986), p. 2-5. 14 Alfred Burnson to Robert Stuart, 28 July 1843, Letters Received by the Office of Indian Affairs, 1824-1880, La Pointe Agency 1831-1880, (Washington: National Archives Microfilm Publications, Microcopy no. 234, 1956), pp. 1-6. 15 Hartley Crawford to Henry Schoolcraft, 6 April 1841, Letters Received by the Office of Indian Affairs, 1824-1880, La Pointe Agency 1831-1880, (Washington: National Archives Microfilm Publications, Microcopy no. 234, 1956), p. 1. 16 Letter 1839, Letters Received by the Office of Indian Affairs, 1824-1880, La Pointe Agency 1831-1880, (Washington: National Archives Microfilm Publications, Microcopy no. 234, 1956), pp. 1-2. 17 U.S., Congress, House of Representatives, The War Department, Schoolcraft and Allen-Expedition to Northwest Indians, House Doc. 323, 1832, 23rd Congress, 1st sess., p. 1156. 18 http://mwlibrary.blogspot.com/search/label/devine%20family. Koller Library. Retrieved 12-7-17. 19 https://mwhistory.org/menu-page-for-maps-and-journals/maps-folder/original-survey-maps-from-the-manitowish-waters-area-1860s/winchester-trail-43-05-east-1860-1862/. Manitowish Waters Historical Society. Retrieved 12-7-17. 20 https://mwhistory.org/2016/wp-content/uploads/2017/01/1918-Outers-Benson-Dam-Sturgeon-article.pdf. Manitowish Waters Historical Society. Pages 6-7. Retrieved 12-7-17. 21 https://mwhistory.org/a-b-gray-journal-1846/. Manitowish Waters Historical Society. Pages 9. Retrieved 12-7-17. 22 https://mwhistory.org/menu-page-for-maps-and-journals/maps-folder/original-survey-maps-from-the-manitowish-waters-area-1860s/island-lake-manitowish-river-42-06-east-1860-1862/. Manitowish Waters Historical Society. Page 447. Retrieved 12-8-17. 23 https://mwhistory.org/2016/wp-content/uploads/2017/01/1890-journal-1907-publication-Shields-Mag-.pdf. Manitowish Waters Historical Society. Pages 9. Retrieved 12-7-17. 24 https://mwhistory.org/2016/wp-content/uploads/2017/01/1900-Forest-and-Stream-select-MW-Dam-Biglk.pdf Manitowish Waters Historical Society. Page 447. Retrieved 12-7-17.